Organisers of continuing professional development courses need a reliable system for the submission and processing of scientific contributions. 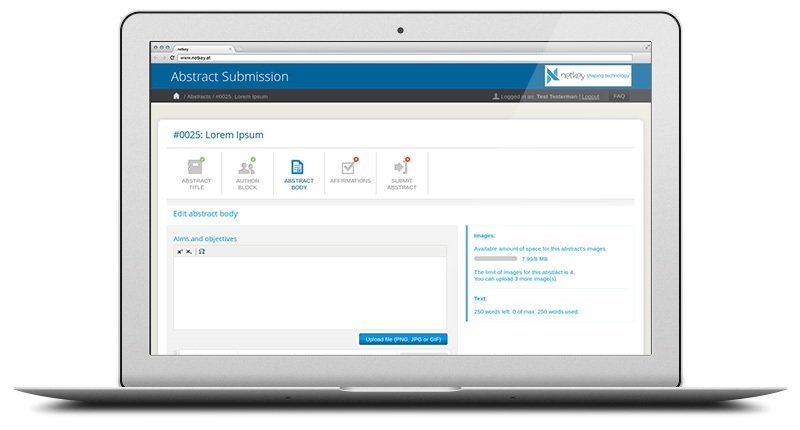 netkey’s Abstract Handling System, a component of eSociety, can be used as a standalone product. It covers all aspects of your process: Submission, evaluation, analysis and further processing. Further uses include exports to the electronic poster system and to the interactive programme planner. Our Abstract Submission System is the ideal partner for small and large scale events and has been tried and tested extensively. Want to learn more? We are happy to send you the product brochure. Do not hesitate to request it from our staff at contact@netkey.at.